Activate location services on your device. The first time you open the app, it asks to use your device’s GPS to determine your location. Hit “OK” to zoom to your position and download satellite and OpenStreetMap (OSM) data. 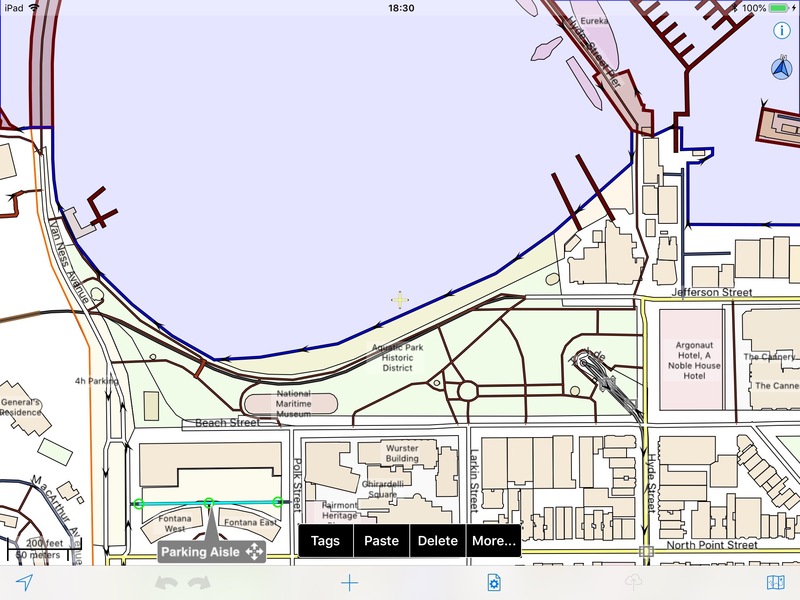 You’ll need a free OSM account to edit the map, register online or from inside Go Map!! in “Settings”. If you’re in a densely mapped area it can take a few moments to download; in a sparsely mapped area you’ll need to zoom out to see details. To pan around your immediate surroundings, pinch to zoom in or out and drag to move. Go Map!! automatically downloads additional data as needed as you scroll around your location. Settings. Two key things are here: the OSM login/signup and the “Prepare for Offline” option, to download Bing and/or Mapnik tiles for offline use. You can also scroll around an area you plan to visit: the Bing, Mapnik and OpenStreetMap data is cached and will be available even without connectivity. Once you’re back to civilization, upload as usual. To create a new POI, tap the “+” button. A pin drops to indicate the position of your new node. If it’s not exactly where you wanted it, drag it (using the title bar) to the correct location, then hit Tags to add information. 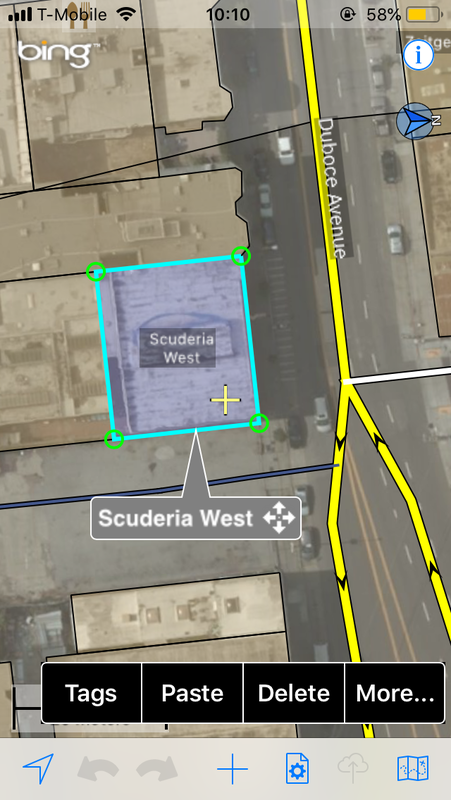 Tags describe objects in the OpenStreetMap database, indicating that a location contains, for example, a business plus information such as its name, hours, website, etc. Tags are standardized in OSM, so make sure to get them right. To add or modify information on a POI that’s already in the map, click the “Tags” button. Then click the “Common Tags” button, which offers a list and a search function. If you’re adding bunch of the same POIs, you can copy Tags or use the Customize Presets function at the bottom of the Common Tags page. If you don’t add any tags, your new node will be discarded. If you drop a pin by accident, tap elsewhere to make it disappear. See more on fixing mistakes in the Troubleshooting section. To modify an existing node or POI, click on it. Selected objects in Go Map!! are highlighted in green and display a title (gray box), as in the screenshot above. 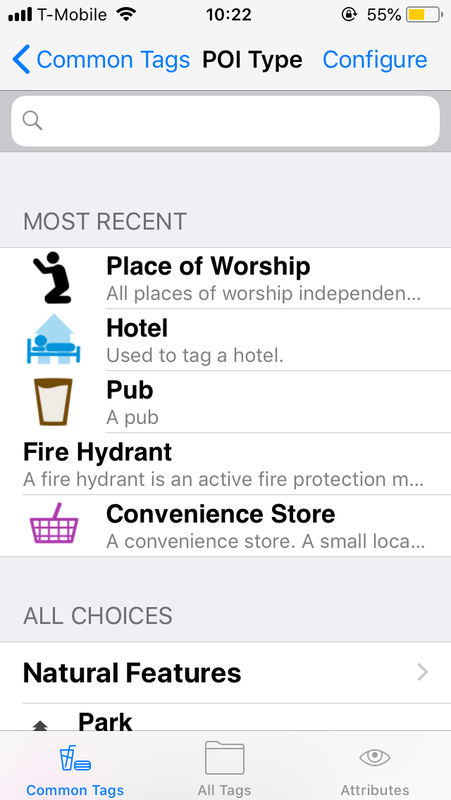 (To select a building, tap on a wall rather than the center.) Then choose Tags to add or modify information. Save each change you make (top right button on the Tags page). 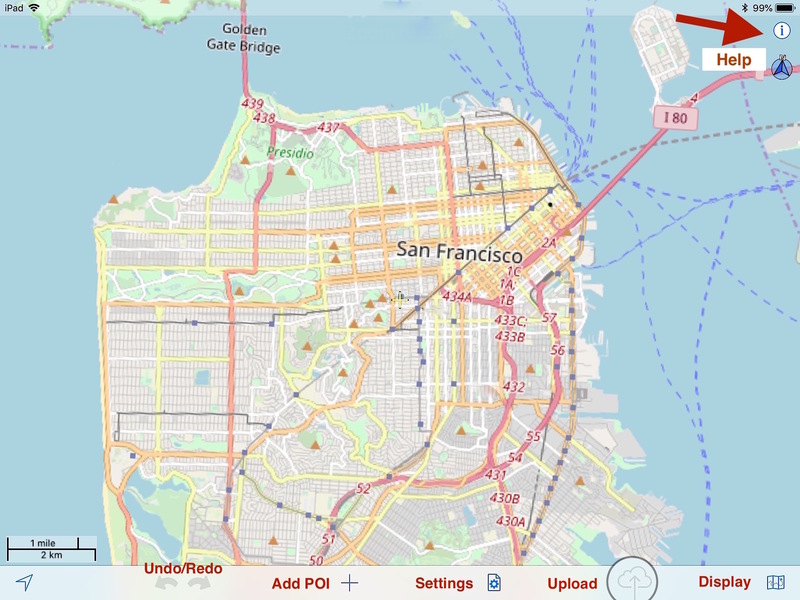 When you’re finished making changes to the map, send them to the OSM server by hitting the Upload (cloud) button. A pop-up screen will ask for a changeset comment – that way the OSM community has a record of what you did – it can be as simple as “added a website.” Once you’ve committed the changes, they are permanent. The app automatically populates the box with your most recent comment – helpful if you’re adding a lot of the same POIs. Hit “Commit” and you’ll get an “Upload complete!” message that returns you to the map. Errors If you make a mistake, the “undo” button is your friend. It’s the arrow pointing left on the menu bar and highlighted in blue every time you initiate a change. 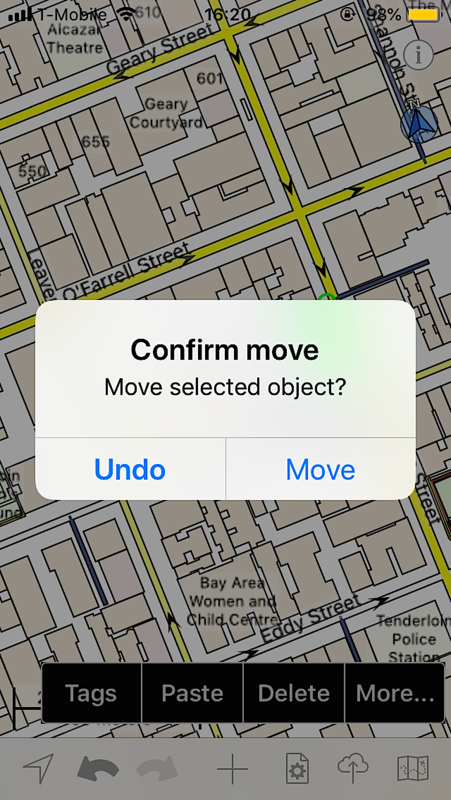 The app also has a second sense for fat fingers and asks to confirm if you move an object. (In the example at left a building was moved.) Remember, once your data is uploaded to OSM, you can’t change it. If your upload fails because of a version conflict or another reason, email the OSM change file (“osmChange.osc”) to yourself from the changeset window to fix offline. This entry was posted in data and tagged editor, Go Map! 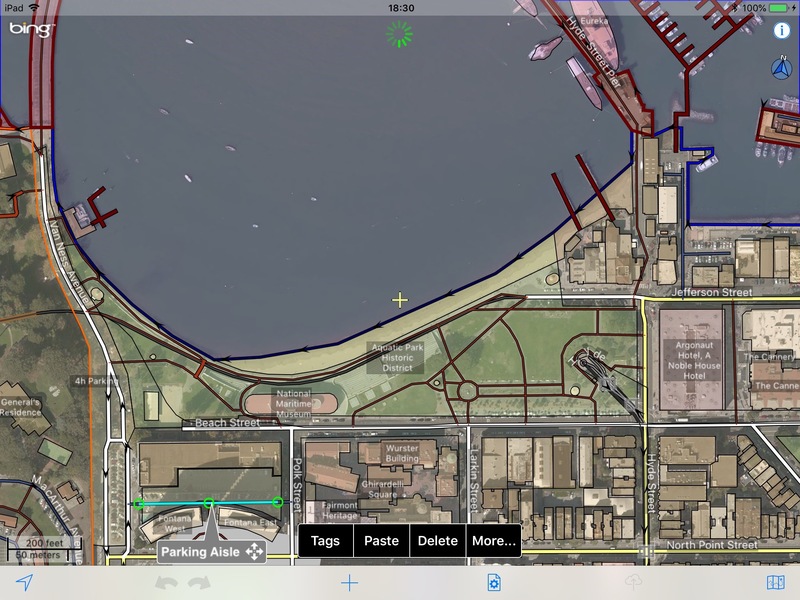 !, mobile, OpenStreetMap, resiliency maps, tutorial by . Bookmark the permalink.